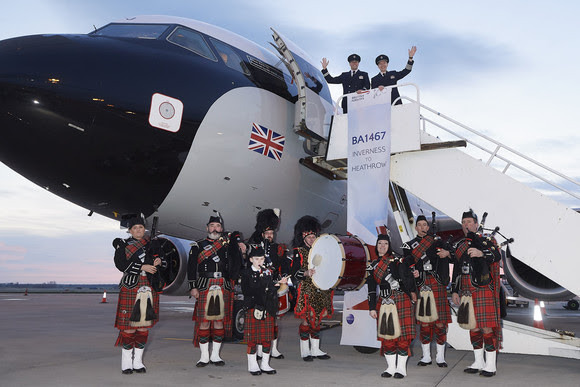 The UK's British Airways has (re)introduced a new early morning flight between Inverness and London Heathrow and to mark the new addition to the schedule BA laid on a pipe band! The Inverness Royal British Legion Pipe Band which, like the airline, is celebrating its centenary this year, welcomed passengers on the Airbus A319 that has been painted in the special historic BEA livery for the centenary celebrations. This morning’s flight means that, for the first time since the route was reintroduced in 2016, British Airways customers will be able to travel between the two cities and return the same day, a major boost to the region’s business sector. From October British Airways will operate a double daily service between the two cities seven days a week. 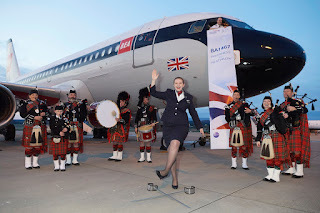 Phyllis Stuart, British Airways’ Airport Manager at Inverness Airport, said: "This is an important day for British Airways, for Inverness and for the Scottish Highlands and Islands. The introduction of our new and expanded schedule gives the people and businesses of Inverness and the Highlands and Islands even greater access to more than 150 destinations on our global network from Heathrow. Departures from Inverness airport do not have Air Passenger Duty (APD) which also benefits the route. This is British Airways’ centenary year, so we were delighted that members of the Inverness Royal British Legion Pipe Band, which is also celebrating its 100th birthday, were with us today to mark the start of our new expanded schedule." Graeme Bell, General Manager at Inverness Airport, said: "The air link between these two cities goes from strength to strength and we very much welcome these additional flights. 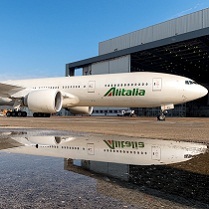 The new service will provide business travellers with more flexibility and connectivity between the two cities. The additional flights will also enhance worldwide connections to the Highlands and Islands, making the area even more attractive to overseas visitors keen to experience the best of what our region has to offer."